Availability: This product is discontinued and no longer available for purchase. For alternatives browse our Commercial Strength department. 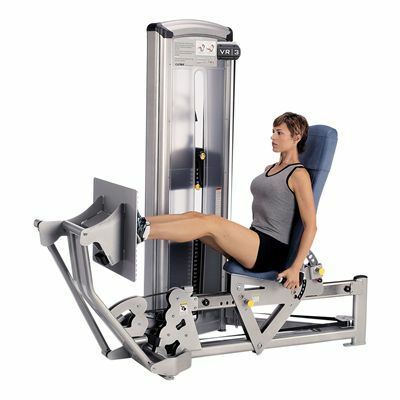 The Cybex VR3 Seated Leg Press provides effective leg exercise, while keeping the body stationary. The Cybex four-bar linkage orientation and the descending path of motion guarantee greater hip range of motion as well as hip extensor involvement. The seat offers five positions of back angle to accommodate users who have difficulty in folding legs back against the belly. Additionally, large footplate surface allows for a variety of foot placement positions, while the moving footplate provides significantly reduced inertia offering more natural feel to the exercise. The VR3’s adjustable carriage accommodates very wide range of users by adjusting to their height and range of motion, whereas its fully enclosed counterbalance system provides consistent resistance even at the lowest weight selections. The VR3 has been designed to withstand the toughest workout routines and is suitable for highly supervised gyms as well as self-service facilities. for submitting product review about Cybex VR3 Seated Leg Press.